Enjoy a unique and enchanting experience you will never forget with the Cabo Dolphin Center's Swimming with Dolphins program. Whether you've been swimming with dolphins before or are a first-time swimmer, our program will leave a lasting impression. Our educational and interactive dolphin swim program is designed to provide a chance for visitors of all ages to have a close personal encounter with friendly, intelligent Pacific Bottlenose dolphins in the comfort of a ten foot deep educational pool specially designed by award winning architect Enrique Norten for Cabo Dolphin Center's program. To prepare for this enchanting experience, dolphin lovers five and older will be treated to an educational orientation in dolphin history, physiology, anatomy and behavior by our dolphin trainers. 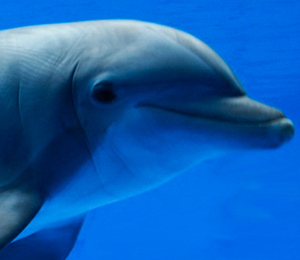 We'll also teach you more about the amazing and intricate underwater communication system that dolphins are famous for. Once you've completed the orientation program, you'll be treated to an enchanting aquatic experience with our dolphins: Dali, Ende, Frida, Merian, Monet, Renoir and Toulouse. Each one has a unique personality and way of interacting with guests and friends, from Toulouse's initial shyness to Renoir's passion for showing off with tricks. These intelligent sea creatures have an amazing ability to get along with humans that never ceases to amaze us or our guests. The dolphins will bond with you as you stroke and pet their sleek, elegant body and they will share their affection by asking for hugs and offering kisses. Once you and your dolphin have bonded, you can enjoy your newfound companionship while swimming and playing. As a safety precaution Cabo Dolphin Center does not allow visitors to bring cameras into any of the pool areas. However, you may still capture this unforgettable moment, as we have a team of photographers available who are specially trained to capture your dolphin adventure. Photos are available for purchase at the Dolphin Center, along with souvenirs, food and beverages. The Dolphin Center has been featured on the Travel Channel, the Discovery Channel, CNN, MTV and BBC among many others, which means that groups fill up quickly. It is imperative that you make reservations well in advance of your visit. Whether you've longed for the thrill of swimming with dolphins for years or are simply interested in learning more about these majestic sea creatures, the Dolphin Swimming program at Cabo Dolphin Center will offer you a new and intimate insight on these most intelligent ocean dwellers while providing an enchanting experience that you will cherish for the rest of your life. A: We have a limited number of participants during our dolphin activities, so in order to assure your place, we suggest your reservation in advance, especially if you plan to visit us during the high vacation season. A: Cameras are not allowed into the pools or observation areas. A: In-water-interactive programs have a remarkable, well-established record of dolphin and human safety. The health and safety records of these innovative programs have been studied, analyzed, and restudied for over 20 years, each time reaffirming their exemplary achievements. Dolphin Centers are located in both Downtown Cabo San Lucas and the Hotel Zone in San Jose Del Cabo. Please call our offices to check the most up-to-date tour times for each location! I have been to the Bahamas many times, but Cabo Signature Swim With Dolphins is one of my favorite trips! It includes everything that everyone should do here. As a Bahamas veteran, I can say only the best about this experience!